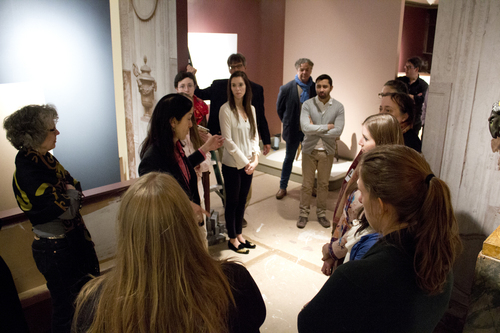 Last week students, curators, conservators and BGC gallery staff spent a great evening together as we participated in an installation workshop for the Hoentschel exhibition that opens on April 3rd. 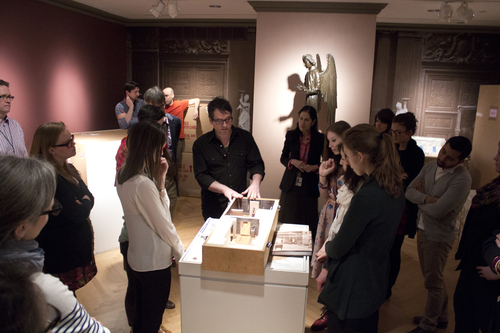 Organized and led by Nina Stritzler-Levine, Director of the Gallery, the two hour session walked students through the whole exhibition process – from first conception to the work that happened in the classroom, and in the basement of the MMA for over three semesters, to design issues, and finally to opening some of the boxes and watching as the art handlers put them into place. 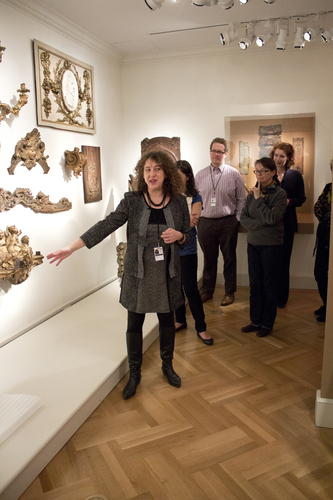 Conservators from the MMA talked about conservation problems and challenges that some of the furniture entailed, and how those decisions were made, in each case. 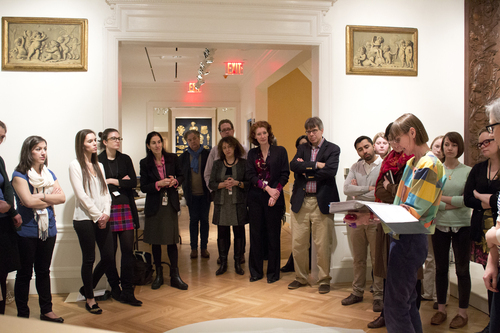 While the curators of the exhibition – Professors Deborah Krohn and Ulrich Leben, along with their colleague and co-curator from the MMA Danielle Lisluk-Grosheide, each addressed the many aspects of this complicated exhibition along with some of the curatorial questions that arose during the several years of planning and work on Hoentschel. Even in its unfinished state, the gallery rooms already look stunning. Salvaging the Past: Georges Hoentschel and French Decorative Arts from The Metropolitan Museum of Art opens April 4th to the public, and runs through to August 11th.